Recently we complete this project on behalf of Stonehouse Projects and Siemens. For this project we created a number of bespoke elements for the Siemens Crystal Cafe refurbishment. The Crystal is based at the Royal Victoria Docks in London and opened in 2012. It is home to the world's largest exhibition on the future of cities, the world's most sustainable events venue, and office space for the global engineering powerhouse Siemens. Phew! 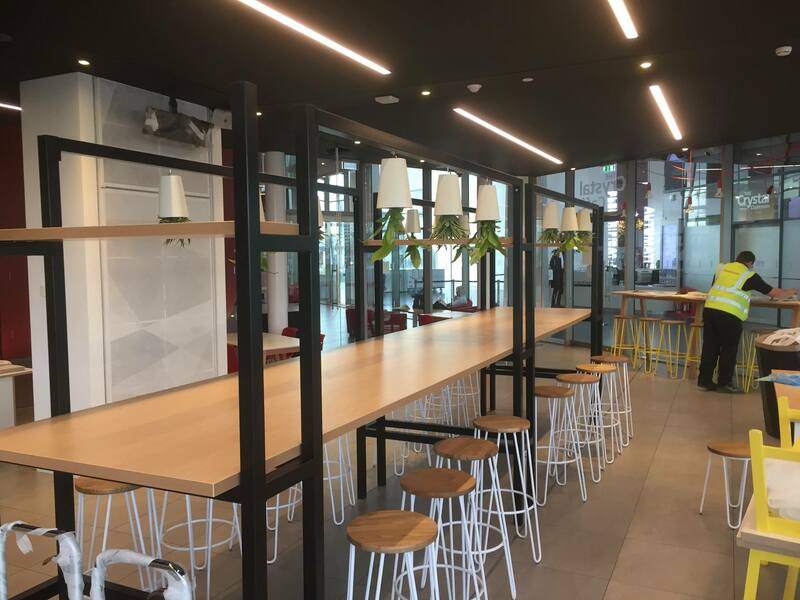 We were tasked with creating a clean and contemporary central table frame which allowed for a number of diners to be seated at. We also fabricated a striking green bulkhead to go over the serving counter. And a living wall which supported Corian planters. To say that the team here was pleased to take on this contract on behalf of Stonehouse and Siemens would be an understatement. It goes to show the hard work and dedication the team here at Iron Octopus put in pays off and attracts blue chip clients who want to work with us!